Ever since the first Free Sticker Week ended back in February '07, I've been sending out WTF Stickers to anyone that mailed me a SASE or a small souvenir. More recently, I've been sending out the coveted TDWTF Mugs for truly awesome souvenirs. Nothing specific; per the instructions page, "anything will do." Well, here goes anything, yet again! (previous: Meal Ready to Eat). A little while back, I received one of the most awesome things one can receive via post: a steak dinner. However, in my write-up of the steak dinner I never mentioned how they tasted. Rick Hiester was curious about that, and decided to take action. "I've never had Omaha Steaks before, so in the interest of sending an 'ultra-awesome souvenir' and learning how they taste, here's a second round." Can do, Rick! Eating food is definitely one of my strong points. However, given the sheer quantity of mailed meat — 6 steaks and 8 burgers — I decided to bring in some help. My first choice was an office cookout, but my coworkers generally try to avoid me, and an after-hours event doesn't fit in with that goal. Instead, I brought in my lawyer (Mr. Van Dress, co-discoverer of The Perch), my insurance agent, and our respective wives. We grilled everything rare/medium-rare, as that's really the only way to eat meat, and chowed down. Overall, it was pretty good: the meat was tender, fresh tasting (i.e. it didn't taste like a frozen steak), and not too fatty. Can I say that Omaha Steaks are significantly better than the local grocery store? Truthfully, I cannot. While the portions are a little smaller, I'd say they are definitely on par with the higher quality cuts available at the butcher counter. But are Omaha Steaks more awesome? Absolutely! There's just something to be said about receiving steaks by mail. But in any case, thanks, Rick! The steaks were very much appreciated: we all enjoyed them. I'd love to send you a TDWTF mug, but the folks at Omaha Steaks would not share with me your address, email, or even pass along a message. Should you want to, drop me a line. "Enjoy!" writes Gabriel Goldberg (Falls Church, VA). Enclosed was pond mosquito poison, a lifeware key fob, a few misc things, and best of all, a key fob from the Microsoft Windows 95 World Tour (slogan The Sky's the limit). "I went to a Metastorm User Conference," Doogal Bell (Surrey, UK) wrote, "here is some of the junk I got." "This is an Ale-8-1," writes David Mayo (Winchester, KY), "it's Kentucky's best soft drink. I found it in the trunk of my car. The expiration date is listed as 'JUN1807' which was just two years ago, so I'm sure it's fine. I mailed it to you so that I will not be tempted to drink it this evening, as it is highly caffeinated and I have to work very early tomorrow morning in Winchester, the birthplace of Ale-8-1." "I was in Hanovo for the Magic: The Gathering Graid Prix," writes Adam Cetnerowski (Poland), and got one of the artists to autograph a card to Daily WTF." Thanks Adam, this is so going in my Thrull deck. "This meadal was given to all employess of WM-data's Estonian office," Indrek (Estonia) writes, "it was given to us following the company's takeover by LogicaCMG and subsequent re-renaming to Logica." "Congratulations," writes raQ (Quebec), "you are now a millionaire!" "I found these things around my house," Joe Czepil writes, "just in case you have to re-file your 2007 taxes, I included a brand new copy of Tax Cut 2007." 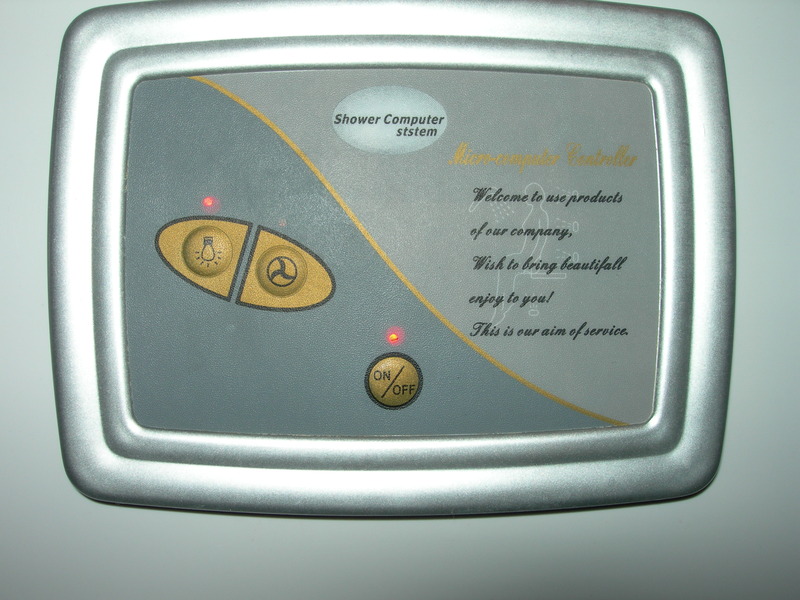 "The reason I'm not going to cash the Google AdWords check is because its processing would cost me $10," writes Arkadijs Sislovs (Riga, Latvia), "I've also enclosed shower.jpg, which shows a China-produced shower cabin that is so advanced that it is controlled by the 'Shower Computer ststem'!" Raymond Lee (England) sent six pence, a 1GB USB Drive (no contents), and a gigantic paperclip. "automobus" (Lincolnwood, IL) sent this Dilbert Posterbook, straight out of 1997. Julan Dax and Jens Schomburg (Siegen) sent a sticker and postcard featuring their University, along with the first German Wikimedia newspaper, and a coupon for jondos. I didn't realize that Wikimedia had transcended into print, or really that the "Wiki" concept even worked in print. Matias Korhonen (Finland) sent some Finnish comics, real estate listings in Finland, a German coaster, a one-day ticket to the Flow Festival in Helsinki, and a used ticket to a Kraftwerk concert. Strangely absent (considering it was from Finland) was Salmiak, the tar-like emetic that tastes about as pleasant as syrup of ipecac. "Enjoy these odds and ends," writes John Yearous (Winona, MN), "there's a bit of everything in here!" And John wasn't kidding. The minature Maglite was one of the cooler things I've seen in a long while, and the Superman Hero Gear solves the Halloween Problem." 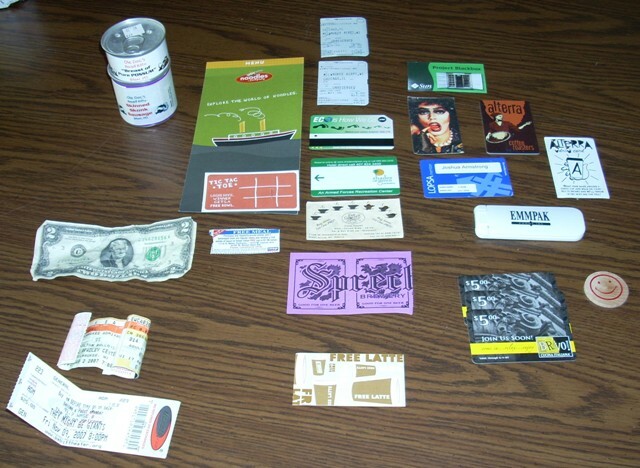 Joshua M. Armstrong (Milwaukee, WI) not only sent a whole bunch of awesome stuff (including a $2 Bill, 1976 series), but took a picture of it and described all of the contents. Don't forget to snail-mail in your own souvenirs for some TDWTF stickers. Ultra-awesome souvenirs (like, say, steak) could even get you a TDWTF mug.